With a strong track record and background in trading, financing and corporate structuring, the Group has today established its Regional based Offices in Dubai (EMEA Region) , India (South Asia- Asia Pac Region), Singapore (South East Asia- Asia Pac Region) , Hong Kong (East Asia - Asia Pac Region) and Canada (Americas Region). Building on the strength and track record established through the Group’s activities in funding investments, joint venture projects and bullion trading. iDM Global is a specialist investment advisory and fund management consulting firm with diversified interests and portfolio in the bullion trade, oil and gas, renewable and clean energy, infrastructure, lifestyle and entertainment, hospitality, real estate and digital media. Geographically, the Group concentrates on the markets that offer the biggest potential, especially Asia Pac, EMEA and Americas, seeking out opportunities to extend the value of our clients in established and strong projects with solid yields and fundamentals. We recognise the importance of core guiding principles to investing successfully are integrity, commitment, diligence and strength. These values define everything that we do in working with our clients, partners, investees and investors as well as the community in which we are invested. This underpins our success and commitment to excellence – excellence in performance, in service and in counsel. OUR INVESTMENT APPROACH is defined by our name. Successful investment is a mixture of both knowledge and experience. Our investment advisors are industry and market experienced professionals with deep knowledge in successful projects in the oil and gas, alternative energy, infrastructure, real estate, education, new media and technology sectors. Working with their network of professionals and consultants our investment advisors will identify the right opportunities and solutions that meet our clients needs, goals and investment horizons. ​We leverage on our extensive regional and international network to deliver strong yields and long term value to our clients. We invest in projects with strong fundamentals and the potential to sustain returns for significant period of time. As a result we work closely with our investees and our investors to develop market opportunities, competitive advantage and potential to realize value and returns. ​Businesses are driven by people. Our proactive participation with management illuminates the path to achieve a common vision. Our success in providing advisory and counsel to senior management and professionals to achieve higher standards and success has been the cornerstone of our own successful relationships with our clients. 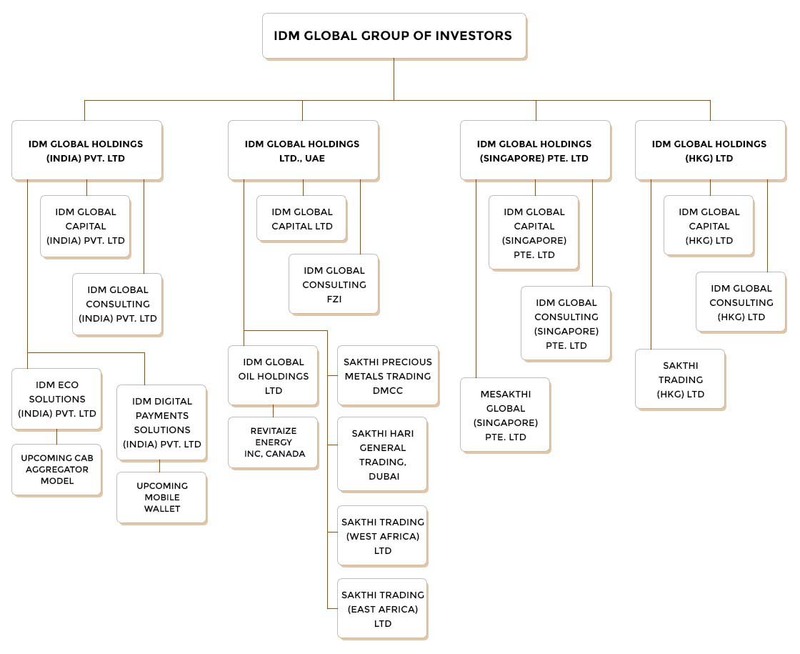 iDM GLOBAL GROUP OF INVESTORS invests in to IDM Global Holding Companies across ASIA PAC region - India, Singapore and Hongkong and EMEA Region - Dubai, UAE . We are also coming up with our presence in the AMERICAS – USA & CANADA shortly. IDM GLOBAL HOLDINGS (INDIA) PVT LTD invests in to promising Business Ventures and Startups across Asia Pac – South Asia region. IDM Global Consulting (India) Pvt Ltd identifies the business, while IDM Global Capital (India) Pvt Ltd develop and manage the business. IDM GLOBAL HOLDINGS (Singapore) Pte Ltd invests in to promising Business Ventures and Startups across Asia Pac - South East Asia Region. IDM Global Consulting (Singapore) Pte Ltd identifies the business, while IDM Global Capital (Singapore) Pte Ltd develop and manage the business. IDM GLOBAL HOLDINGS (HKG) Ltd invests in to promising Business Ventures and Startups across Asia Pac – East Asia Region. IDM Global Consulting (HKG) Ltd identifies the business, while IDM Global Capital (HKG) Ltd develop and manage the business.